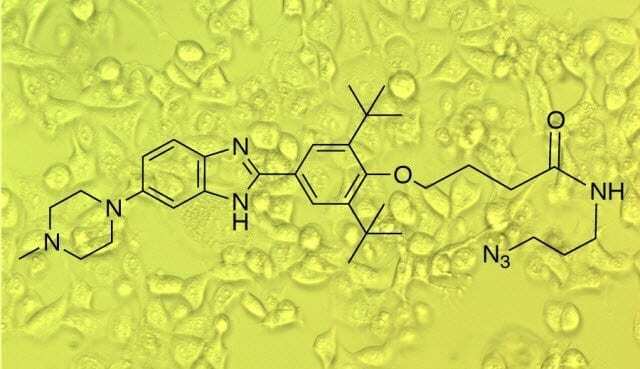 As proof-of-principle, the team designs a potent anti-cancer compound. In research that could ultimately lead to many new medicines, scientists from the Florida campus of The Scripps Research Institute (TSRI) have developed a potentially general approach to design drugs from genome sequence. As a proof of principle, they identified a highly potent compound that causes cancer cells to attack themselves and die. The technique, described in the journal Nature Chemical Biology online ahead of print on February 9, 2014, was dubbed Inforna. In their research program, Disney and his team has been developing approaches to understand the binding of drugs to RNA folds. In particular, the lab is interested in manipulating microRNAs. Discovered only in the 1990s, microRNAs are short molecules that work within virtually all animal and plant cells. Typically each one functions as a “dimmer switch” for one or more genes; it binds to the transcripts of those genes and effectively keeps them from being translated into proteins. In this way microRNAs can regulate a wide variety of cellular processes. Some microRNAs have been associated with diseases. MiR-96 microRNA, for example, is thought to promote cancer by discouraging a process called apoptosis or programmed cell death that can rid the body of cells that begin to grow out of control. As part of its long-term program, the Disney lab developed computational approaches that can mine information against such genome sequences and all cellular RNAs with the goal of identifying drugs that target such disease-associated RNAs while leaving others unaffected. In the new study, Disney and colleagues describe their computational technique, which identifies optimal drug targets by mining a database of drug-RNA sequence (“motif”) interactions against thousands of cellular RNA sequences. Using Inforna, the team identified compounds that can target microRNA-96, as well as additional compounds that target nearly two dozen other disease-associated microRNAs. The researchers showed that the drug candidate that inhibited microRNA-96 inhibited cancer cell growth. Importantly, they also showed that cells without functioning microRNA-96 were unaffected by the drug. April 18, 2019 - Arrakis Therapeutics Announces $75 Million Series B Financing to Advance a New Class of Small-Molecule Medicines Targeting RNA Associated PressPress release *content* from Business Wire. The AP news staff was not involved in its creation. April 18, 2019 - Medicare Part D must evolve to help people fight cancer STATMedicare Part D hasn't kept up with revolutionary advances in cancer care and is now falling short in protecting many older Americans fighting cancer. April 2, 2019 - Lyophilization can help create food for space travel, new medicines for cancer Phys.OrgResearch continues on an eventual 140-million-mile mission to Mars, developing the latest transportation as well as habitats necessary for the red planet. April 8, 2019 - New medicines approved for Scottish NHS BBC NewsMedicines for treating liver cancer, migraines and psoriasis are approved for use in Scotland's health *service*.